Atlantic or Mediterranean for a day at the beach? We had yet another tough decision to make last weekend – should we head to the Mediterranean or the Atlantic for a day on the beach? There can’t be many places you can live (in fact there aren’t because I checked on the map) where you can choose to spend the day either at the Mediterranean coast or at the Atlantic, depending on weather and sea conditions. 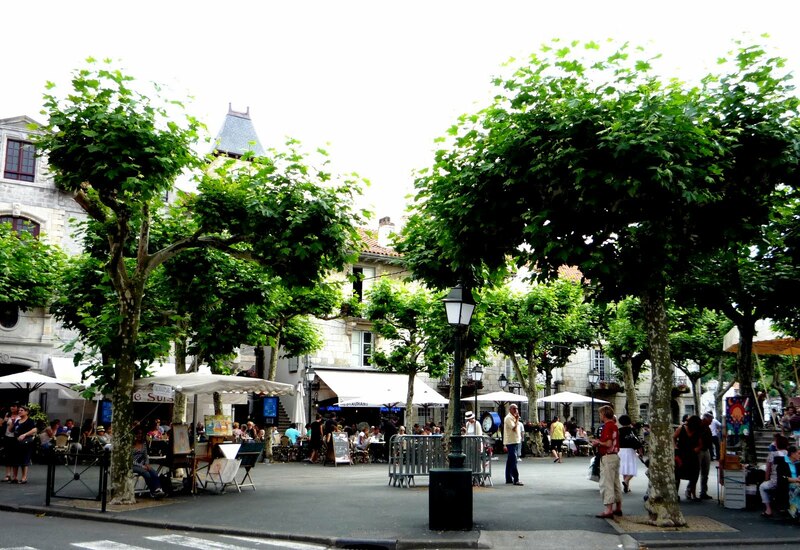 We happen to live roughly equidistant to both and hence, yesterday, having studied Meteo France’s forecast the night before, we decided we would have a day on the beach in the lovely town of St Jean de Luz on the Atlantic, just over two hours’ drive away. The Mediterranean lost out this time as it was forecast to be a good few degrees cooler than the Atlantic. Had we decided to go east to the Med however, we would probably have headed down to the lovely town and beaches of Collioure, also around a two hour drive away. Either direction is a very easy drive with great mountain views most of the way. Often the Mediterranean coast is warmer in the Spring and Summer months than the Atlantic, as you would expect but it is also affected by the Tramontane wind which blows along the coastline from Spain sandblasting anything in its way. Not a pleasant experience and even worse for little ones who get the full force of the sand in their face. The Atlantic on the other hand, is known for its surf and can be dangerous for swimming in places but there are plenty of protected bays where it is calm and safe to swim plus the sea stays warm through the Autumn and right into November when it is certainly still warm enough to paddle, sit on the beach and have lunch on the terrace. Well for us Brits anyway; our French neighbours think we are completely mad to venture near the sea out of season, which is just fine as far as we are concerned – all the more beach for us. In fact we are quite happy to avoid the peak holiday season of July and August at either the Med or the Atlantic, preferring to head to the mountain lakes and rivers for our picnics and paddling, away from the tourist crowds. 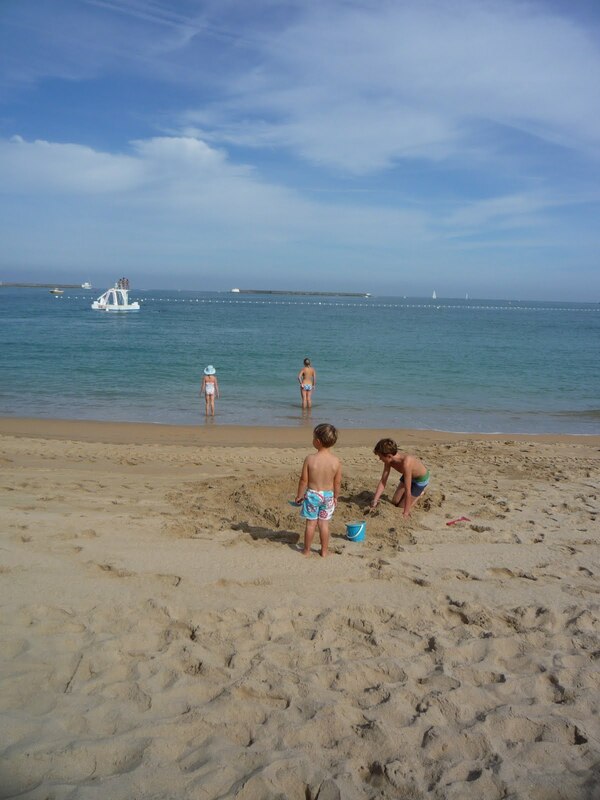 St Jean de Luz yesterday was just perfect – we were enjoying coffee and Gateau Basque on the terrace by 10am and then spent the morning on the beach before tucking into plates of seafood at our favourite restaurant for lunch. 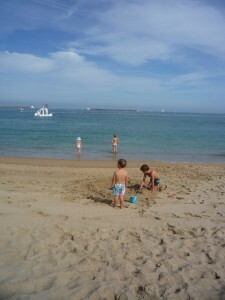 Then back to the beach for some tennis, serious sandcastle construction and swimming. We finished the day with a final ice-cream and walk around the pretty streets before heading off around 7pm. A great day out and another tough decision made successfully!